Capable of chambering either .410 shotgun shells or .45 Colt ammunition, this amazing 5-shot combo gun is ideal for short distances. MIAMIâ€“Taurus introduces its newest Judge--the scaled-down Model 4510 "Public Defender." 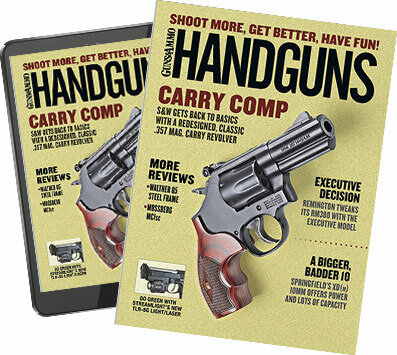 This Judge delivers the same devastating firepower in a new, more compact version based on the famous Model 85-sized frame that is sure to revolutionize small frame revolvers. The Public Defender also features a new reduced profile hammer that will not catch or snag for a quick and reliable draw. Capable of chambering either .410 shotgun shells or .45 Colt ammunition, this amazing 5-shot combo gun is ideal for short distances--where most altercations occur--or longer distances with the .45 Colt ammunition. The rifling has been finely tuned on this small frame revolver to spread the shot pattern at close quarters or to guide the bullet to the target. The Public Defender is available in three finishes--matte stainless, blue steel or blue steel frame with lightweight titanium cylinder. All Taurus Judge models include fixed rear sights and fiber optic front sights as well as Taurus' ergonomic Ribber Grips. Additionally, like all Taurus handguns, the unique Taurus Security System allows users to securely lock the gun using an inconspicuous key-lock.